Next week we are headed to Maryland for the Inc. 5000 awards ceremony! Because of that, we wanted to drop our press release in here! 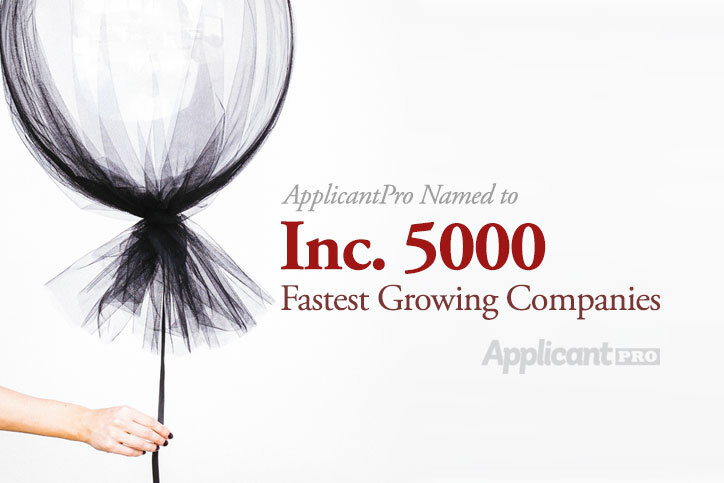 ApplicantPro has been named one of Inc. magazine’s 5000 Fastest Growing Companies. ApplicantPro was ranked 1309 out of 5000, placing in the top 25%. They appear alongside companies such as LivingSocial, Lumosity, and other thriving startups. Rankings for placement are calculated using an algorithm that considers increase in revenue and employees over a 3-year period. ApplicantPro enjoyed a 3-year growth rate of 309%, and it’s employees increased from 3 to 23 during that same period. ApplicantPro’s founder and CEO, Ryan Kohler, started the company in May 2005 and has been honored by Utah Business Magazine as one of the top “40 CEO’s Under 40″ in Utah. ApplicantPro’s software streamlines the hiring process and offers various solutions for HR professionals. Their robust system automates job posting, applicant tracking, screening candidates, background checks, onboarding, and much more. Because the software is extremely cost-effective, it’s become popular with small and large businesses alike with employees ranging from 50 – 5000+. It’s robust functionality also make it a great fit for businesses with a broad range of hiring needs, such as hiring infrequently, seasonally, or on a constant basis. To view ApplicantPro’s ranking with Inc., click here.